Is your deck looking dull and tired? If you haven’t already begun to give your outdoor living space a facelift this summer, it’s not too late to consider some of these basic ways to transform the look and add a boost of energy. Clean, Repair and ReStain Flooring. Most flooring materials require regular maintenance to keep up with dirt, chips, cracks, peeling paint and fading. If time doesn’t allow, consider hiding smaller imperfections by covering with a beautiful outdoor area rug. Benches with hidden storage are a clever way to add extra seating for guests and hide floating items. Pair with custom weather-proof cushions and pillows for added comfort and style. Create distinct zones for lounging, grilling and dining for maximum comfort and efficiency. 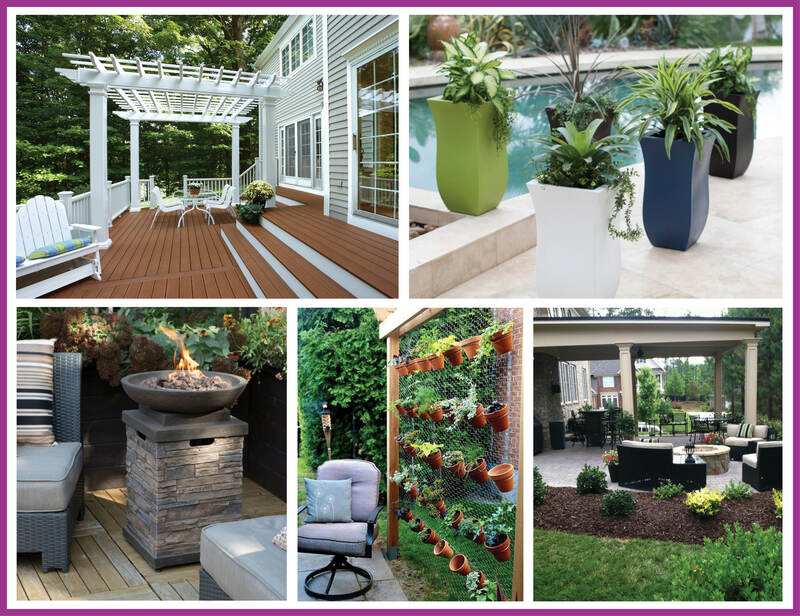 Whether bursting with flowers or greenery, plants are a perfect way to soften the perimeter of a deck or patio and enliven the space. Choose ceramic pots in bold colors and cluster several with varying heights for depth and interest. Vertical wall gardens are very on-trend this year and are great space savers. Don’t forget about the shrubs and perennials in beds surrounding your patio/deck. Trim, remove dead plants and add fresh mulch to brighten things up and create an inviting oasis. Paired with comfortable furniture, a fire pit can turn an ordinary patio into an inviting gathering place. There are many styles to choose from including open wood or natural gas, free standing or built-ins with tables. For more outdoor decorating ideas, click here to link to our Outdoor Living Spaces Pinterest board.